Pam Bray Designs: A Girl with Flair: Happy New Years Tag and Thank You Card with Gypsy Soul Laser Cuts! 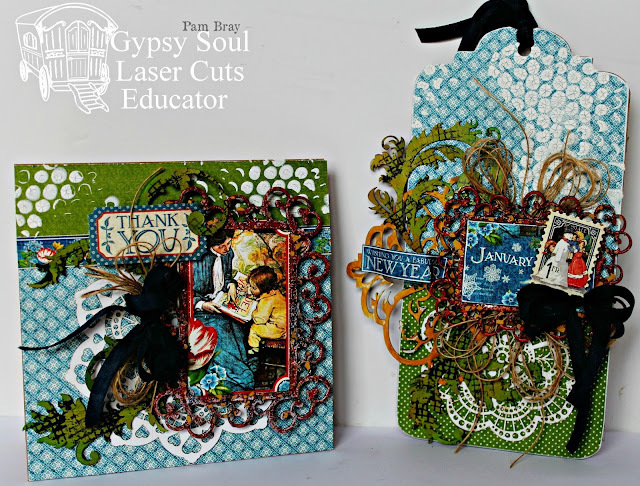 Happy New Years Tag and Thank You Card with Gypsy Soul Laser Cuts! Happy New Year and "huge" Thank You to all my Gypsy Soul Laser Cuts fans!!! 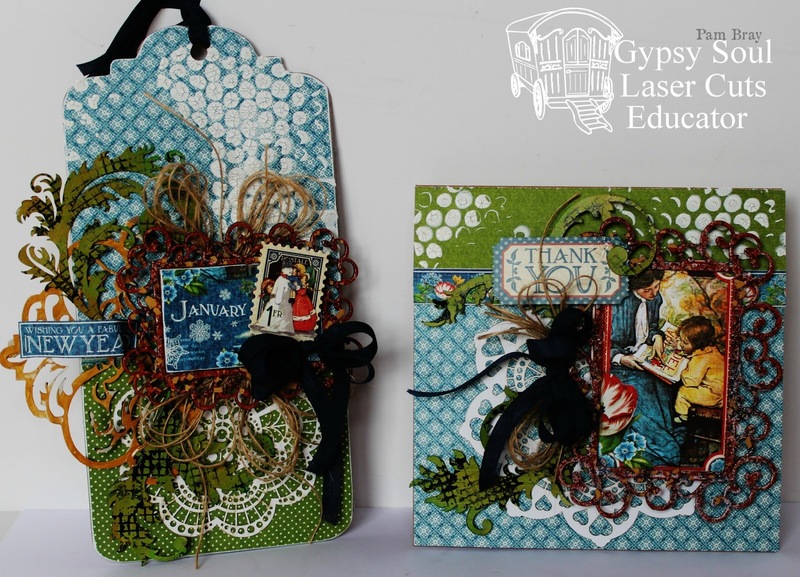 Today I am sharing my combination New Year Tag and Thank You Card using Tags In A Box Display, Feathery Flourishes Set, Filigree Frame Shape Set, Damask Singles, and doilies. Adhere pattern paper to the top of one of the tags from Tags In A Box Display. Lay stencil on top of prepared tag; apply crackle paste with palette knife. Dry. Paint Damask Singles and Feathery Flourishes Set with paint; allow it to dry. Stamp the Feathery Flourishes Set with black paint; dry. Adhere doily to top of tag. Adhere prepared Damask Singles and Feathery Flourishes to the top of tag. Emboss Filigree Frame using Boss Gloss and Rust Embossing Powder. 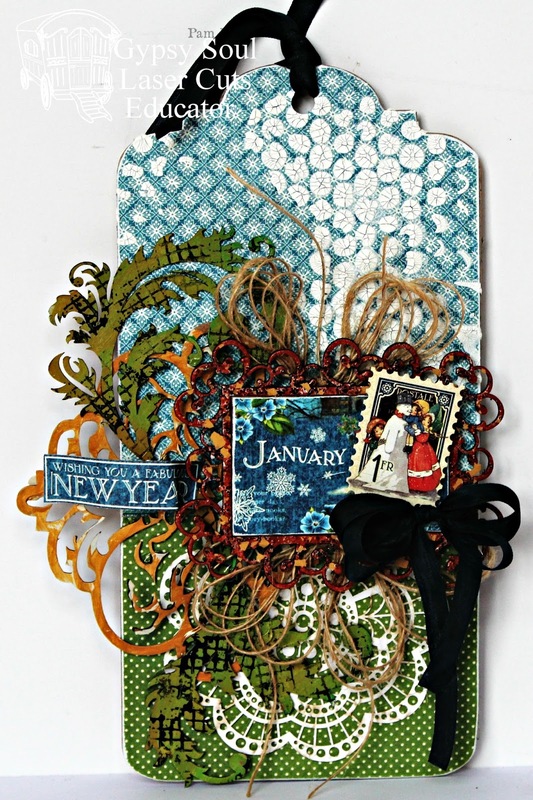 Add twine and silk bow to front along with the "Happy New Years" banner to complete tag. 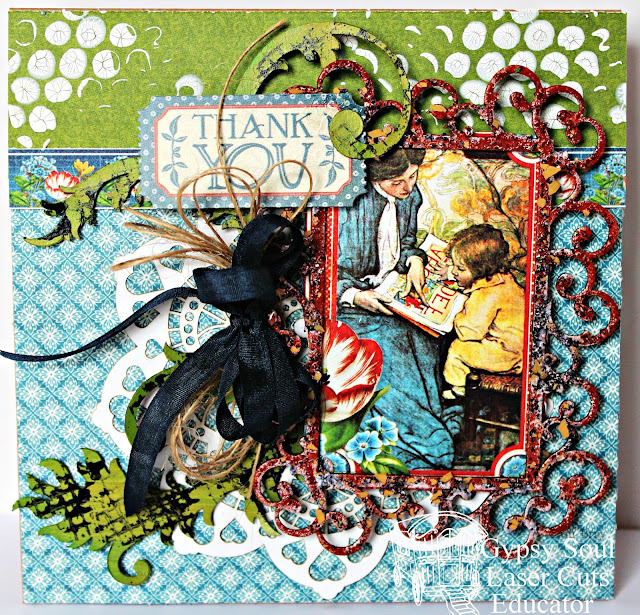 For my Thank You Card....use the same designer papers along with the same techniques on the Gypsy Soul Laser Cuts chippies. Adhere chippies to prepared card front. Add "Thank You" sticker to front of card. Add prepared frame to top of card. I just love your work. Your attention to detail is amazing! Happy New Year Pam!!! !